Mavericks Server comes with a few new alerting options previously unavailable in versions of OS X. The alerts are sent to administrators via servermgrd and configured in the Server app (Server 3). 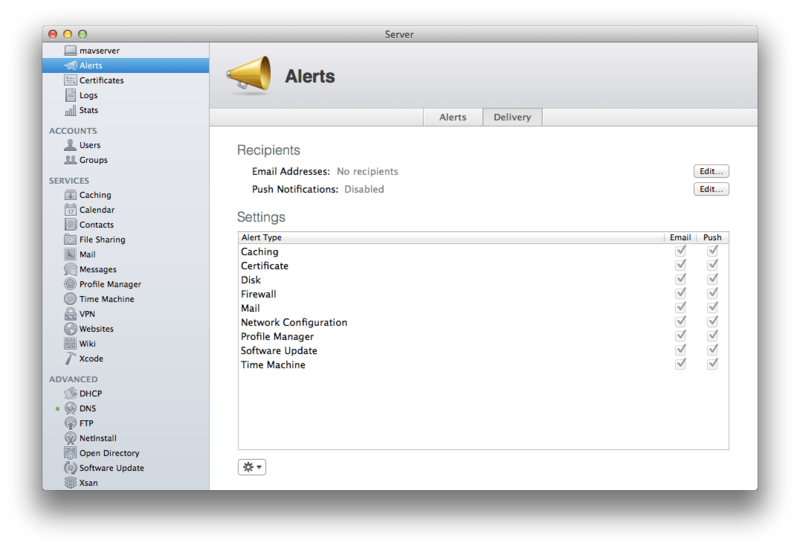 To configure alerts in Mavericks Server, open the Server app and then click on Alerts in the Server app sidebar. Next, click on the Delivery tab. At the Delivery screen, click on the Edit button for Email Addresses and enter every email address that should receive alerts sent from the server. Then click on the Edit button for Push Notifications. Here, check the box for each administrator of the server. The email address on file for the user then receives push notifications of events from the server. Click on OK when you’ve configured all of the appropriate administrators for alerting. Click on the Edit… button for Push and if Push notifications are not already enabled you will run through the Push Notification configuration wizard. Then, check the boxes for Email and Push for each of the alerts you want to receive (you don’t have to check both for each entry). Alerts have changed in OS X Server, they are no longer based on the SMART status of drives or capacity; instead Delivery is now based on service settings.